In the next five years, WWF Nepal will continue its sustainable livelihoods program that builds on and promotes peoples’ strengths, skills, assets and potential. The programs will ensure livelihood security (food, water, energy, economic and social) for communities that live in and around protected areas and other priority sites, as well as help reduce pressure on natural resources that they depend on. 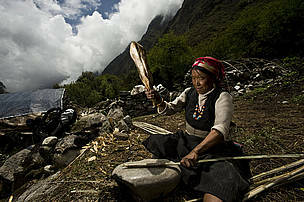 Promotion of ecotourism and creation of ‘green jobs 9 ’ will be given key emphasis in the sustainable livelihoods program. 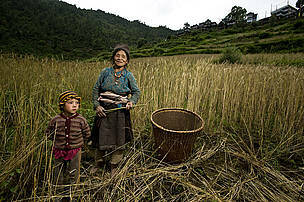 WWF Nepal will identify and work with the asset-deprived, vulnerable and marginalized groups, who are often the most severely affected by resource depletion and climate change. WWF Nepal will monitor the change in livelihoods and good governance at both community and landscape levels to assess the program impact. Sustainable Livelihoods Mainstreaming Strategy 2011 will work as a guiding document, describing the rationale and methods for addressing livelihoods and social issues, including its scope and monitoring procedures. 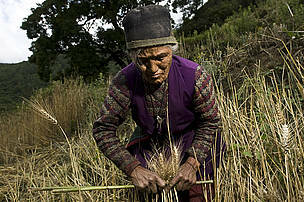 A woman working in Langtang to provide for her family's daily needs. GOAL: To secure community livelihoods in order to reduce pressure on natural resources and sustain healthy ecosystems and environmental services.